Does it seem like you spend most of your Internet time waiting for pages to load? Do you think super-fast Internet has to cost a fortune? Stop wasting time and money on slow Internet service! With Qwest High-Speed Internet you get quality, Internet with speeds that blow dial-up out of the water, all for one low monthly price. 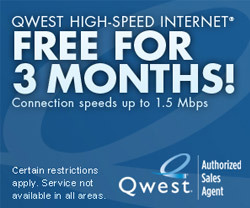 Qwest High-Speed Internet allows you to download videos, music, images, and other large files at lightening-fast speeds. No extra phone line is necessary, and DSL doesn't tie up your existing line, so you can talk on the phone and surf the web at the same time. And because Qwest High-Speed Internet is always connected, you won't waste time worrying about busy signals and waiting for your modem to connect. All of Qwest's High-Speed Internet plans feature the QuickConnect installation kit, 2GB of e-mail storage, and quality telephone technical support 24 hours day, seven days a week! You also get top-of-the-line protection from viruses and undesired Internet content with firewall, anti-virus safeguards, parental controls, and more.